Adam Kelly entered the Ivy ranks in the midst of a hammer throw high period. More Ivy throwers are surpassing the 200 foot mark in the hammer throw (a total of four this season) and making a statement on the national scene. Kelly is one of those four throwers as he has easily adapted to the collegiate weights in both the indoor and outdoor seasons. For hammer/weight fans, these next few years will definitely be exciting to follow. Kelly finished as the runner-up at both Indoor and Outdoor Heps to Cornell’s Rudy Winkler. These finals provided marks that were not only among the best in meet history, but also in conference history. He was also a contender on the national scene as he finished 14th overall at the NCAA Outdoor Championships in June, earning Second-Team All-American honors. Kelly now sits in the Ivy League record books at #8 in the weight throw (69-00 ¾) and #5 in the hammer throw (221-05). Nationally, Kelly is 22nd (#2 freshman) and 16th (#4 freshman), respectively, with those marks. It will be fun to compare Kelly to Winkler this upcoming year as they continue to go head-to-head. Like Winkler, Kelly graduated from high school as the top hammer thrower in the nation. Kelly’s marks from his rookie season are comparable to Winkler’s when you compare their first collegiate season marks (Kelly’s 69-00 3/4 vs Winkler’s 68-00 1/2for the weight; Kelly’s 221-05 vs Winkler’s 223-05 for the hammer). 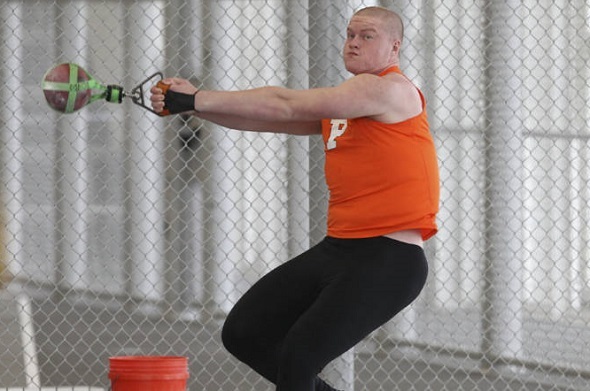 Given Princeton’s historical conference success in these weighted throwing events – 16 indoor weight and 15 hammer throw conference titles, the most for any school in the conference – we can say with good confidence that Kelly is certainly going to keep getting better and will provide great battles with Winkler and Brown’s rookie Owen Russell for many competitions to come. Myles Marshall (Harvard) – Marshall came into the Ivy League as one of the top high school middle distance runners in the county. He quickly set fast times once he set foot on the track in the Crimson uniform. His first Indoor Heps didn’t quite go the way he wanted as he fell on the first lap of the Indoor Heps 800m final, but he rebounded to finish in scoring (6th). It appears he channeled that disappointment into useful energy as he anchored the Crimson to a 4×800 relay victory. The same quartet won the Outdoor Heps 4×800 title. Fortunately, Marshall was able to avoid any major contact in the 800m final, finishing second overall in that final. Charles Volker (Princeton) – Volker may be a football player, but he is a speedy one. He won the indoor 60m title in 6.73 – tied for the second fastest in meet history and conference all-time. He earned an outdoor title in the 4×100 relay and later finished third in the open 100m (10.56). Volker will have plenty of competition with Menchaca these next few years, and I bet they will keep pushing each other to faster times at the upcoming Heps championships. This entry was posted on Friday, December 30th, 2016 at 12:00 pm. It is filed under Athletes, Awards, Spotlight. You can follow any responses to this entry through the RSS 2.0 feed.